By Jim Dower: Tyson Fury (27-0-1, 19 KOs) will reportedly be facing #2 WBO Tom Schwartz (24-0, 16 KOs) of Germany in his next fight on June 15 on ESPN at the Thomas & Mack Center, in Las Vegas, Nevada. Top Rank will making an announcement this Saturday during the Kubrat Pulev vs. Bogdan Dinu fight on ESPN about the name of Tyson Fury’s next opponent for the 15th of June. For the fans that aren’t interested in sitting through the televised Pulev-Dinu card on ESPN to hear the name of Fury’s next opponent. Schwartz is similar type heavyweight as past Fury opponent Francesco Pianeta. There’s not much difference between the two. Although Schwartz has excellent size at 6’5″, he’s not much of a puncher. His power is roughly on the same level as Fury’s. The news of Fury potentially facing Schwartz instead of a more talented heavyweight will disappoint some boxing fans, as Schwartz has been mostly facing weak opposition in record-padding fights since he turned pro in 2013. 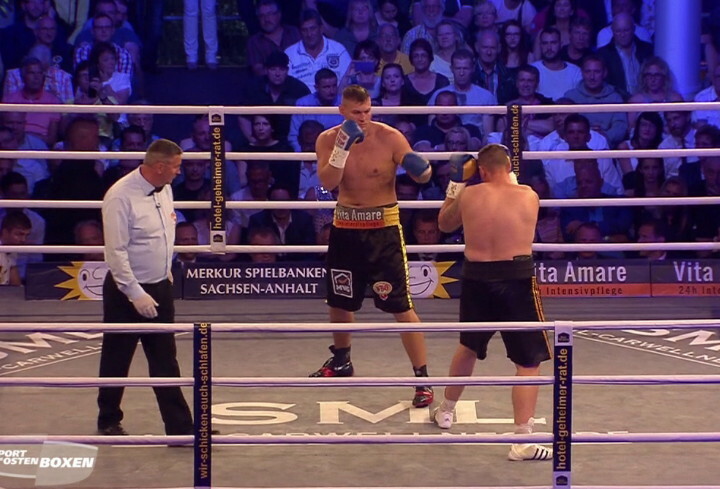 Last year, Schwartz was involved in an odd fight against Senad Gashi in which he appeared to flop after being head-butted. It looked to some like Schwartz was intentionally trying to get the victory through disqualification of Gashi, which is precisely what happened. Schwartz didn’t look impressive at all during that fight. He was taking shots from Gashi, and looking more or less on the same level as him talent-wise. The idea of matching Fury against the big 6’5″ Schwartz is Top Rank’s plan of building up the British fighter to make him more of a household name in the United States before looking to match him up against either WBC heavyweight champion Deontay Wilder in a rematch or IBF/WBA/WBO champion Anthony Joshua. Fury, 30, is coming off of a 12 round draw against WBC heavyweight champion Deontay Wilder last December in Los Angeles, California. Fury could have signed for a rematch with Wilder for a fight on May 18, but he instead signed with Top Rank, who has other ideas for him for the time being in wanting to put him in winnable fights on ESPN to build up his name. This will be Fury’s first fight of his new contract with Top Rank Boxing. The American promotional company’s boss Bob Arum believes the 6’9″ Fury is the best heavyweight in the division, and he sees star potential in him. It’s an uphill climb though, as Fury’s fighting style is more like Guillermo Rigondeaux in being defensive, and not like former heavyweight champion Mike Tyson. The American boxing fans like for heavyweights to be sluggers for the most part. Fury’s style of fighting, which emphasizes lots of movement, feints and trickery, is an acquired taste. Some U.S boxing fans will like watching Fury fight, while others will be put off and look to turn the channel and avoid watching his fights in the future. It’s possible that if Fury wins his fight against Schwartz, and Wilder defeats his WBC mandatory Dominic Breazeale on May 18, then we’ll see a Wilder-Fury II rematch later this year. It’ll depend on a number of circumstances though. If Top Rank decides they want to continue to let the Wilder vs. Fury rematch marinate, then the two won’t face each other this year. Further, Wilder could go in another direction and sign for a unification fight with Anthony Joshua. With the way that Fury was knocked down violently in the 12th round by Wilder last December, it’s a good idea that Fury face a weak puncher like Schwartz rather than someone with power.